This week the National Center for Missing & Exploited Children released four new 3D facial reconstructions of four murder victims, giving new life to a case that has stymied investigators for more than 27 years. 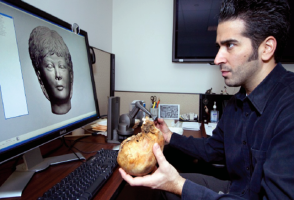 The facial reconstructions were created in Geomagic Freeform, where Forensic Imaging Specialist Joe Mullins sculpted the victims' features on top of skeletal CT scans. This mystery may stretch back to the late 70s, when investigators believe the crime took place. The first victims were not discovered until 1985, when a hunter found a woman's and a young girl's remains in a barrel. The other two victims, both young girls, were not discovered until 2000. No missing persons report has been located, and no one knows the identity of the victims. Investigators want to give them a name and give them justice. They're hoping these facial reconstructions will tip the case over the edge, sparking recognition in someone who knows them. Better yet, they're hoping someone knows what happened. For more information on the National Center for Missing & Exploited Children, click here.